Ryland Peters & Small, 9781788790697, 144pp. Just as with any ingredient, the flavors in oils and vinegars must complement the foods they are paired with in order to bring out their subtleties. 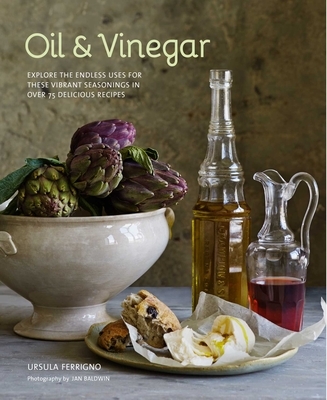 In this mouthwatering recipe collection for the oil and vinegar aficionado you’ll discover which types (and flavors) to use to make classic appetizers like Beef Carpaccio with Gorgonzola and Walnuts, refreshing salads, such as "Dama Bianca", and exceptional pasta dishes, like Orecchiette with Chickpeas. You’ll learn how to make delicate, refined fish dishes, such as Poached Turbot with Watercress Oil and aromatic meat dishes, including Pork Roast Braised with Milk and Fresh Herbs. You’ll also be able to put your baking skills to the test with Potato and Gorgonzola Focaccia before tucking into one of the sublime desserts, including an incomparable Olive Oil Ice Cream. Finally, you'll discover the secrets of divine dressings, magnificent marinades, and clever dessert cocktails, which you can make with your own homemade vinegars.